One major difficulty for business owners is maintaining their custom sign. They proudly display it for everyone to see, however it’s incredibly frustrating when the lights within the sign go out, or the sign breaks. A broken sign or a sign not functioning properly can look bad on the company. This can lead to customers being drawn away to other competitors in the area. This makes repairing or replacing a custom sign is imperative to the well being of any business. It’s the first impression a business makes on a potential customer, so a broken sign might be a sign of a sloppy business or one that doesn’t care about its appearance. It’s important to know when it’s time to repair a sign before it ever breaks. Devastating storms and natural disasters can wreak havoc and cause chaos across an entire community. An insurmountable amount of damage occurs to business and residential neighborhoods across an entire region. It’s common for custom signs for businesses to be broken or potentially destroyed in the process. In this event, it’s vital businesses get their sign back up and running as fast as possible. Having no sign on the storefront or a broken sign can lead to customers still thinking you’re in the rebuilding process, which leads to further lost revenue. If a business owner gets their sign repaired as quickly as possible, they can get back to driving revenue to their company as quick as possible. A rebranding can be a very exciting moment for a business. It can completely shift a company’s goals and their outlook for years to come. With a rebranding comes a completely new or updated look from the one before. To complete the rebranding process, a company needs a new sign to match. Having the new sign can draw in brand new customers who are solely interested what the sign is and what it relates to. Rebranding is a new start for a company, and replacing the old sign with a brand new one can completely take the company to whole new levels. Scheduled maintenance on a sign can find that parts within the sign have greatly deteriorated. Weather and neglect can greatly wear down a sign, which can lead to it falling into disrepair or not functioning the way it was originally designed. Implementing a sign maintenance schedule can ensure that the sign is up to date and working properly. If it’s discovered that the sign is close to falling apart, it can be quickly repaired and kept working far longer than it would have if was broken. Knowing when it’s potentially time to repair or replace a custom sign for a business can remove the stress of having to take care of it when it suddenly goes down. With Testa and Sons, you’ll never have to worry about your sign falling disarray. As the number one Custom signs designer in South Florida, they also offer unrivaled installation and repair services on all of their signs. 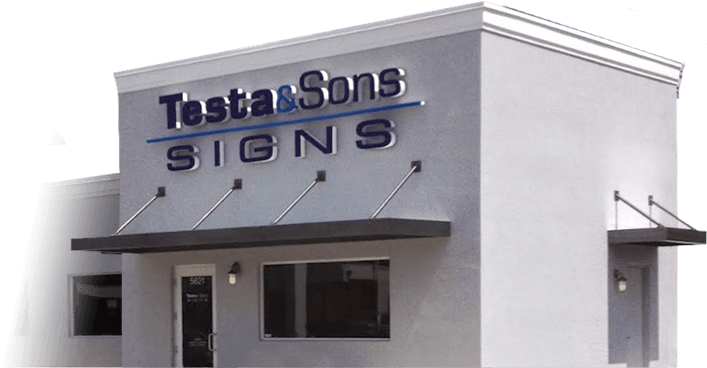 If you’re looking to take your brand to the next level, make sure to contact Testa and Sons custom signs today at +1 (954) 962-5840.